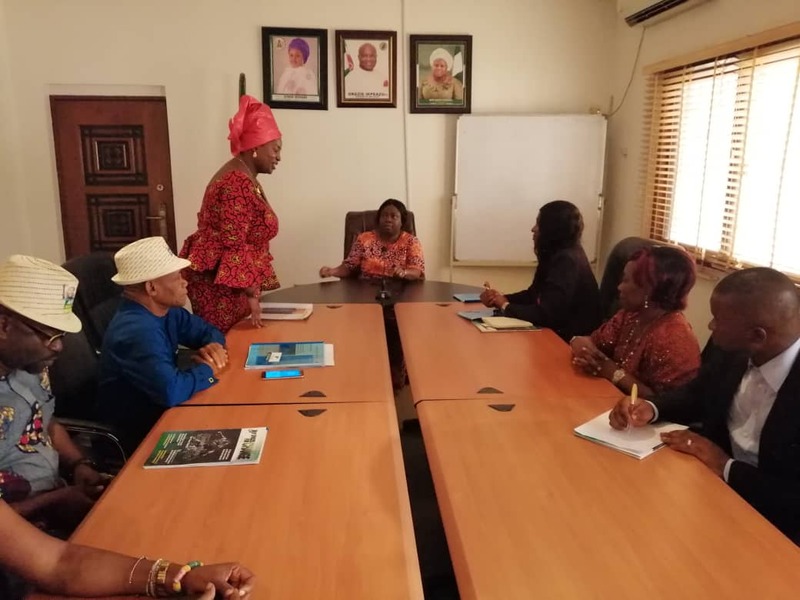 SPACES FOR CHANGE | S4C presented the findings of its extensive evaluation of the Home-grown School Feeding Program (HGSFP) to the Abia and Imo State Governments on January 22 and 24, 2019, respectively. Backed with evidence from rigorous household surveys conducted in the two states—that directly engaged 8, 315 pupils, 669 parents, 88 public primary schools in urban and rural areas, 55 head and assistant-head teachers and 43 food vendors, totaling 9,082 persons—SPACES FOR CHANGE presented independent feedback to state authorities , including the HGSFP implementers, in order to deepen their understanding of aspects of the program that are working or not working, and inspire them to take steps to bridge gaps in implementation, wherever they exist. Receiving the S4C team warmly at the Abia State Government House, Umuahia, the wife of Abia State Governor, Mrs. Nkechi Ikpeazu, commended SPACES FOR CHANGE for the thorough investigation of the HGSFP program delivery processes in the state, and for communicating the findings directly to the program stakeholders. She assured that corrective action will be taken in respect of areas that need adjustment. The presentation progressed with more in-depth discussions with state house officials, including the honorable commissioner for Information, Mr. John Okiyi Kalu, Special Advisers and Special Assistants to Abia Governor, the programme manager of Abia School Lunch Program and HGSFP, Elder Emeka Ahuruonye, and members of the HGSFP project team. In Imo, the state HGSFP coordinator, Mr. Onu Okonkwo, together with 35 directors and permanent secretaries of seven key ministries and parastatals received the S4C delegation. Participating ministries include Ministry of Gender and Social Development, Ministry of Talent and Youth Development, Ministry of Health, Imo State Universal Basic Education Board, Ministry of Gender and Social Development, Ministry of Lands, Ministry of Happiness and Purpose Fulfilment and the National Union of Teachers. The meetings started with a discussion around the methodology SPACES FOR CHANGE employed during the evaluation of the HGSFP. In order to achieve a thorough assessment of the performance of the Home-Grown School Feeding Programme (HGSFP), SPACES FOR CHANGE conducted an extensive review of secondary data sourced from internal and external sources. To fill the gap in the reporting and analysis of publicly-available data, the organization carried out field and household surveys, and held focus group discussions with a broad spectrum of stakeholders, not limited to vendors, head teachers, local farmers, and parents of children in public primary schools etc. Among other findings, SPACES FOR CHANGE highlighted the strengths, gaps and challenges the initiative is facing in the two states. Notable strengths of the feeding program in both states include spikes in school enrolment, improvement in school attendance and learning outcomes for children, flourishing local economies, women empowerment, among others. Analysis show that the enrolment rate in the states increased significantly. In one school in Abia State, student population increased from 305 to 406, and jumped from 300 to 402 pupils in another. Incidents of pupils moving from private schools to government-owned primary schools were recorded, especially in Ohafia Local Government Area was also noted. Related to school enrolment is school attendance. The research established that school feeding motivated the children to come to school, much earlier than before. Ultimately, the programme has been successful in checking truancy and improving learning outcomes in public schools. Similarly, the program created employment for vendors, and the vendors interviewed in different parts of the state were women. The HGSFP specifically empowered women with economic opportunities, and access to resources to participate in, and benefit from governance. Agreeing with the findings, Abia state officials disclosed that the school children feeding program increased enrollment from 106,000 to 600,000 in Abia State. Also, both teachers and pupils in all classes, from primary one to six, are benefitting from the scheme. Unlike Abia State where plans are also underway to extend the programme to junior secondary schools in the state, the school feeding program in Imo currently targets only pupils in primary 1 – 3 in public primary schools in the state. The feeding program started much later in Imo State. In other words, Imo State is among the last set of states to benefit from the federal initiative. Beyond the high points, some aspects of the programme need serious oversight and adjustment. They include insufficient food rations, low quality control for meals served in schools, poor learning infrastructure, delay in vendors’ payments, unclear selection criteria for vendors, inadequate monitoring and oversight mechanisms, among others. Insufficiency of meals topped the list of complaints from the pupils interviewed. In some cases, enumerators spotted up to three pupils sharing an egg or small portions of food. This situation is however linked to funding limitations. Vendors demanded an increase in monthly payments to enable them serve quality meals and increase food portion. Survey responses from 56 out of 4,102 students also disclosed frequent complaints of diarrhoea after meals – most especially, potato porridge. Given the reportedly minimal involvement of school authorities and community members in the implementation of the program, food quality control needs to be enhanced. Vendors prepare the meals independently, mostly in their homes and deliver at schools. Adequate supervision of meal preparation sites and methods will be necessary to enhance oversight and quality control of the meals served to the pupils. While the HGSFP has indeed boosted enrollment and attendance rates, and improved learning outcomes in schools, the surge in student population has equally put a stress on the existing educational facilities. The results are overcrowded classrooms, inadequate learning materials and shortage of teachers to manage the influx of students. Most vendors interviewed demanded a review of the meal funding allowance and want the government to address the occasional delay in payments. Sometimes remunerations are disbursed late in the month or completely skipped. Although the project is enabling households, especially mothers, to save time and money, the flip side is that some parents are now shifting their feeding obligation to the schools. The survey recorded several responses from children who no longer eat breakfast and lunch at home because of the feeding program. 515 out of 3869 pupils interviewed in Imo do not eat before going to school. Consequently, fainting in class is now rampant in many of the schools, with attendant effects on child welfare and development. More tellingly, the criteria for vendor selection is unknown, with many vendors revealing different modalities followed in their selection. Similarly, what informs posting to schools is not clear, fueling public distrust and claims of political patronage. In Imo, issues that dominated discussions ranged from inadequate oversight and monitoring mechanisms, exclusion of certain classes in the scheme, nutritional quality of the meals, and the non-involvement of the Imo State Ministry of Education in the implementation of the HGSFP. Similarly, in Abia, the discussions dwelt on quality control, especially in relation to high incidences of purging among school children after eating potatoes, irregular payment of vendors, and limited information flow and community participation. At the end of the two meetings, SPACES FOR CHANGE proffered a set of recommendations and action plans designed to guide project implementers to take action to increase accountability to stakeholders. Some of the recommendations include improving program accountability through strategic communication, awareness campaigns and periodically publishing reports of public spending on school feeding. Also, states were urged to ensure that monitoring and evaluation teams incorporate the services of health professionals, like nutritionists, to enforce high standards in hygiene and sanitation. Importantly, there is need to assign monitoring teams to every school where the program is operative. Also, , effective channels of communication need to be put in place, especially for pupils in order to elicit feedback that can be used to assess progress and improve results. SPACES FOR CHANGE conducted the independent evaluation of the HGSFP with support from Trust Africa. With about 10.5 million out of school children across Nigeria, the National Home Grown School Feeding Programme was introduced to provide one hot meal every school day to pupils of public primary schools, with a view toward boosting primary school enrollment, attendance and completion rates in the country. By sourcing food from farm produce locally grown by smallholder farmers, the school feeding programme further aims to create employment and bolster the production of home grown foods. SPACES FOR CHANGE conducted the independent evaluation to assess the program performance in the two states, and ascertain the extent the program was realizing its stated objectives.